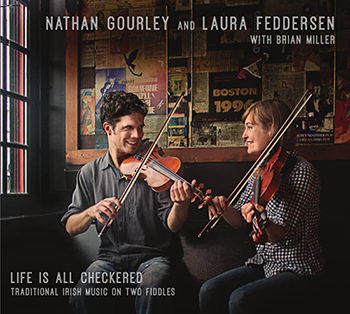 "...equally impressive, with individual style as well as convincing emulation of past masters..."
"...a must-have album from a pair of brilliant players..."
Nathan Gourley and Laura Feddersen are two of America’s most highly regarded young players of traditional Irish music. Their playing is steeped in lifelong study of the Irish tradition, and is at same time colored by their American roots. The pair have developed a unique style of twin fiddling, sometimes playing in taut unison, sometimes exploring chordal harmonies and rhythmic and melodic variations. Nathan adds tastefully intricate chords and driving rhythm on guitar. The duo live in Boston, Massachusetts.